We were pleased to have the opportunity to talk with Krishala Burchill who's designs are now available on Etsy. Check out all the info and then see below for a fab giveaway! Describe your design style. Jalouise is the world of fashion’s newest addition, showcasing trendy new designs on custom T shirts, quality comfort clothing, and stylish accessories that add a taste of stylish sparkle to any wardrobe! Jalouise strives to stay two steps ahead of the hottest fashions to be hitting runways nationally, and yet pays close attention to both customer needs and satisfaction. What's your favorite color? Red! Where do you get your inspiration? The inspiration of Jalouise bloomed from the unique vision of an at-home mom. Krishala obtained the firm conviction that with both determination and creativity, a successful company could be formed that would cater to people interested in both comfort and style. Krishala took her large vision and applied it towards creating a small company, which affectionately became known at Jalouise. As Jalouise has continued to grow and expand its territories nationally, its products and fashions have become notorious for becoming welcome additions to wardrobes internationally. How do your items take on their sense of character? Jalouise utilizes a combination of color and universally appealing themes to captivate the attention and adoration of fans everywhere. Jalouise devotes an abundance of time and energy into ensuring that its images, products, and creations are ones that are bold, diverse, and edgy, but that still obtain firm roots in broad-based customer appeal. By striving to merge the world of unique charm with quality products strategically designed for durability, Jalouise has developed a product line that has become notorious for pleasing even the most deliberate of shoppers! What do you think your biggest challenge as an artisan is? As an artisan and/or designer, my greatest challenge is to ensure that my product line always expresses new and fresh ideas and components. It is my goal to constantly come out with what will be appealing in a fashion-sense next week, or next month. Fashion changes constantly. Styles need be be born, re-born, adopted, and adapted every single day. While constantly staying one step ahead in the fashion-world, as a designer, I feel it is my responsibility to ensure the quality of the items and lines I am developing. My biggest challenge, therefore, is really to stay ten steps ahead of the game in terms of ideas, and to remain firm in my goal to please every customer with products marked by strength, and quality. What is the most cherished item you have in your shop? The most cherished item I have in my shop? Surely, this would be my fans and customers! My primary objective as a designer and a store-owner is to make sure that my customers and my fans are number one. It is because of their support and admiration that I have been able to initiate my own clothing line. Jalouise develops its products based on the needs and desires of its customers. Therefore, it is my firm conviction that ultimately, the single most important thing to me, as a designer and a company executive, are my supporters – and their continued satisfaction. Any unique ways you market your shop? (on etsy or otherwise): Jalouise periodically picks random fans and customers and will send them items that we are considering adding to our product line. These products or gifts, are designed to show customers that we appreciate their support, inspire them to provide us with continued feedback, and to encourage them to be a part of our production team. It is our company’s goal to please each customer. Therefore, we pride ourselves in introducing potential products to our already existing customers, seeing what they think, and inviting their ideas and thoughts to enter into the realms of our creative design department. What is the best thing about owning your own Etsy shop? Etsy provides Jalouise with the unique opportunity to branch out and introduce itself to markets that have currently been unexplored. By opening its doors to Etsy, Jalouise hopes to formulate long-lasting business relationships with partners, develop a strong base of creative customers who enjoy the delightful combination of comfort and style, and to develop a direct line of communication between corporate management, and customer needs. Jalouise by Krishala Burchill is definately one shop you will want to heart. In fact, you could win a tank top just by doing so! Krishala has generously offered a tank top (your choice of size and color (except black)) for one lucky reader! The rules are so simple. All you need to do is any of the following, them come back here and make a comment telling us you did so. You can do as many of these items as you like and then make a comment for each item letting us know. Each comment is an entry into the contest! 5. You can also enter by twittering about the giveaway = up to 2 entires (one for each tweet!) and coming back here and telling me about it. Please include my twitter account in the update: i'm @sspaperie on twitter! 8. Please just make sure that each entry is its own comment = more chances for you to win!!! Thank you and good luck!!! Please do not include your email address within the actual comment for privacy. i like the jalouise tank in blue. i think someone skinny, like kate moss, would look great in these tanks! i called my best friend this morning and we end every call with an i love you! I "heart" her shop - my username is Hurdler4eva. My favorite is the Jalousie tank in Black! I think Natalie Portman would look great in Jalousie! I called my friend Danielle and told her about Jalousie - she is a big fan of indie designers! I like the Jalousie Tank in Grey. I totally heart this shop! I like the jalouise tank in blue! My favorite item is her Jalousie Tank in Gray. I love how modern it is. I think that the celebrity who would look best in it is Kate Hudson. 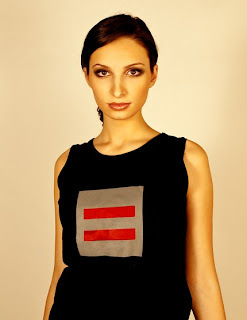 I hearted her shop - especially my favorite is the equals sign tank top! I liked the tank in grey! love this one Jalousie Tank in Grey SMALL!!! I think Mischa Barton would look cool in it. I like the Jalousie Tshirt. Great for free marketing!!!! Celebrity who should wear these cool design = Heidi Klum! Nice and lean. I think Taylor Swift would look great in her shirts. I hearted her.... and love the Jalousie Tshirt! Just before this I emailed a friend in Seattle to say hello, Happy Holidays....and I wish we could see each other! *That was fun and easy to do....thanks for reminding us to reach out to others. I like the design for the Jalousie TShirt. Gorgeous! I think Rachel Bilson would look good in these designs. Thanks! Love the Jalousie Tshirt . Just hearted Jalousie on Etsy and actually love this tanktop(http://www.etsy.com/view_listing.php?listing_id=36656538) and hope I get lucky enough to win it! Thank you. SUCH a great tee!!!!!! Being a feminist and believing in equality makes me want that tanktop!!!!! I think Angelina Jolie would rock one of these designs! I called my Mum and told her she is the best! I would love to have this t-shirt! Love the products and your site! My fave on Jalousie is the t-shirt with the flower/red circle design. Thanks for the contest! I could see Julia Roberts in the Jalousie designs. Thanks for the contest! I e-mailed my friend, Patricia, to tell her how much I value her friendship and to tell her that I'm thinking of her during the holiday week because I know she's feeling a bit lonely all alone in California. Thanks for the contest! I like the Jalousie Tank in Blue. I think Selena Gomez would look cool in these.